The oldest daughter of revered composer Leonard Bernstein offers a rare look at her father on the centenary of his birth—illuminating a man, a city, and an era that defined modern culture—in a deeply intimate and broadly evocative memoir reminiscent of Alexandra Styron's Reading My Father and Richard Ford's Between Them. To his eldest daughter, Jamie, he was all that and more; he was the man in the scratchy brown bathrobe that smelled of cigarettes, who sat late at night at the piano when he couldn't sleep (he could never sleep). An incredible jokester, an incessant teacher, he taught her to love the world in all its beauty and complexity. In public and private, Lenny was larger than life. In Famous Father Girl, Bernstein mines the emotional depths of her childhood and invites us into her family's private world. A fantastic set of characters populate the Bernsteins' lives, including: the Kennedys, Mike Nichols, John Lennon, Richard Avedon, Stephen Sondheim, Jerome Robbins, and Betty (Lauren) Bacall. 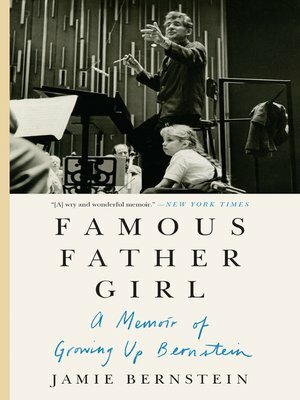 An intoxicating tale, Famous Father Girl is an intimate meditation on a deeply complex and sometimes troubled man and the beautiful music that was the soundtrack to his life. Deeply moving and often hilarious, Bernstein's beautifully written memoir is great American story about one of the greatest Americans of the modern age. Jamie Bernstein is a writer, broadcaster, and filmmaker. She travels the world as a concert narrator. Her documentary, Crescendo: The Power of Music, is available on Netflix. She lives in New York City.